“Metamorphosis” (2017) by Zahra Ebrahimi, mixed media on canvas, 50 x 75 cm. The word pairing, cellar door, is not beautiful for its meaning. Yet, its sonic aura is said to have transfixed geniuses like philologist J.R.R. Tolkien and poet Edgar Allen Poe as the Victorian heyday of Romantic poetry unraveled before the fin de siecle, toward new inventions of language, throwing off the naturalistic formalism of the classics in favor of the supernatural dynamism of the future. It was a trend that sought the naive purity of the modern imagination bound only to the present. The ways in which people wrote, read and listened to words and made art changed, coinciding with radical redefinitions of the relationships between mind and matter, individuality and creativity, society and production. It also coincided with a violent confrontation further devoid of reason, strangling everyone under the arms of industry, regardless of economic distinction. Even elites among the wealthiest of Ottoman families would not escape the fate of history, presaged by ideological breakdowns in the arts. Comte Moise de Camondo, the son of Sephardic Jewish bankers, would disappear from the title of his inner-city mansion now known as Adahan, which lures locals and travelers alike to its stunning rooftop cafe and basement art gallery. From the heart of Istanbul's traditional European district of Pera, not a single descendant of the Camondo family would live to see the current, stylish renovation of his former residence, built in 1874 when he was only 14. His entire progeny would fall to combat and genocide in Europe, obliterated by two world wars that ensued, and continue in other forms, as a result of the nationalist power struggle for control over the global economy. Around a well-kept alleyway near Kıraathane 24, an exhibition space for the literary community and the temporary location for Istanbul Modern, finely procured marble steps lead to a sleek elevator past the hotel reception. At the underground level, there is a cellar door. By any ordinary interpretation, the door itself would be negligible, simply an object to mark and divide a way through which someone might pass into the interior. At the same time, its symbolism, to signify it in speech, carries a wholly other dimension, one defined by nonessential grace, by the pure elegance of the sound. Within that awareness, crossing the threshold where idea and sensation merge, the primary theme of "Metamorphosis" is clear, encompassed by the old, dusty ambiance of the rough brick archways and unmoved medieval metalwork centered by a well now covered with soil to complete the otherworldly curation of 25 mercurial works by 16 broad-ranging artists. Tima Jam, who founded her artist agency Blue Rhino in 2010, is unique in her efforts to bridge the Iranian and Turkish art worlds. 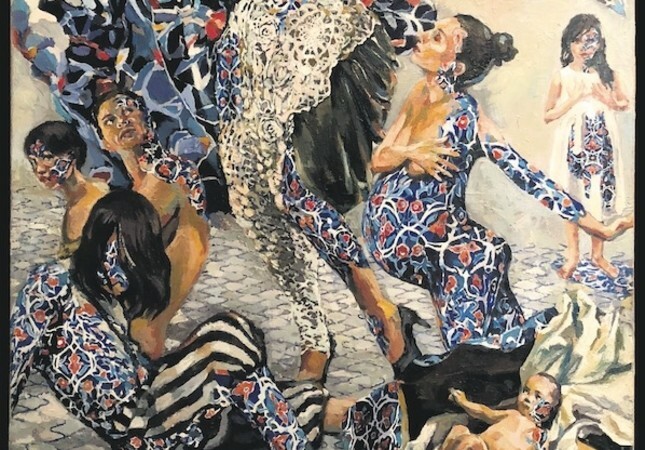 Her shows, "Metamorphosis" among them, offer visual insights into the comparative light where Persia and Turkey share an inner sense of direction. Inspired by intimate, personal revolutions that spark reformations of daily consciousness and direct perception into such inner growth spurts as that gleaned from creative visions and philosophic contemplations, Jam organized "Metamorphosis" after a number of studio visits in Iran and in concert with her bustling network in Turkey, conveying a strong taste for the traditional mythologies common to the ancient flourishing of Central Asian civilization, and its presence in perpetuity. The bygone elements and distinctions of classical Iranian and Turkish identities, folklores, ecologies, wildlife and crafts reemerge out of time from the individual journeys of contemporary artists who continue to work in the lands that once housed the spirits of lost, pre-modern worlds. While extinct beliefs, languages and modes of being are all but forgotten, the intuition of steadfast creatives bent on giving shape and substance to enduring sources of mystery has an evocative, entrancing quality. The invisible and impalpable varieties of nature in which many of the figurative and non-representational works are set appear fished from deep within the collective psyche, especially in a comparative Persian-Turkish context as that which Jam curates for the world-weary public. "Metamorphosis is something you can see everyday. It's about what pushes you to transform, and to experience a metamorphosis inside of you. Maybe your face is the same, but you feel like someone else, totally changed. Metamorphosis is often about a change in shape, but for me it's about something else, your mind, your feeling, your character," said Jam, surrounded by the antique ambiance of the Adahan cellar, accompanied by two assistants, including the embroiderer Damla Yalçın, who will exhibit in "Metamorphosis II." "I am still human, but I might feel like a fish or a dog. The artist Reza Razm has a collection of 20 pieces and behind every piece is a couple, a relationship, someone sitting, drinking coffee. The body is human, but the faces are different animals. Metamorphosis is about how people are affected by society and the people in their lives, how they become another person," Jam noted. Iranian contemporary art, generally speaking, has a number of illustrative signatures infused with powerful breaks from and alignments to tradition, as in the contrast between black and white shades, and the transparency of drawing in the composition. "Metamorphosis" delivers a monumental treasure trove of works by artists based in cities across Iran, from Tehran to Isfahan, Babol and Ghazvin, pivoted by multigenerational knowledge transmission. The master painter Ahmad Nasrollahi is featured with one of his students, Farhad Gavzan, who founded the nonprofit Drawing Museum last year, and who has, in turn, taught Hossein Tadi, whose drawings and writings have become key to the creative growth of millennial artists in Iran. Zehra Ebrahimi is one of the youngest artists to exhibit in the first part of "Metamorphosis," yet she does not show it. Her works have a conceptual maturity reminiscent in the mid-career oils of Fahrelnissa Zeid, a name synonymous with Turkish modernism. Her two mixed media canvases are titled, "Metamorphosis" (2017), spilling with a shock of patterns typical to the floral Iznik relief, coursing over the chestnut-hued flesh of women in various life stages. It provokes interpretations on the transcendence of Orientalist identity and reveals the impositions and internalizations of self-censoring that would impede holistic personal growth and greater appreciation for human and environmental diversity. Ebrahimi is joined in generational solidarity with Nasim Malekpour, a child of the 1990s, whose mixed media canvas, "Untitled" (2017), has the fantasy edge of a dark, animation film, pockmarked with a visceral technique to gravitate the effect of a lunar craters against the texture of skin. The paintings of Reza Razm exude a related process, as he practically sculpts his oils with his palette knife for a gritty, multilayered effect that is anything but superficial. And against the worn, fragmented brick of the Adahan cellar, his geometric backdrops are all the more absorbing even to the most fickle eye. Malkepour, despite her age, is a leader in the field where art and psychology intersect into mental health. As an art therapist, her work with children suffering from behavioral and psychiatric disorders is paralleled by another artist at "Metamorphosis" nearly 20 years her senior, Gökhan Deniz, an award-winning civil society activist and human rights practitioner who manages art workshops for prisoners and psychiatric patients. "Distance" (2012), a mixed media work on stainless steel by Deniz, is an interactive piece that creates a symbiosis between the art and its audience. The portrait literally looks back at viewers with a pair of binoculars that gleam with the reflective medium, enticing passing thoughts on the nature of objectivity in interpersonal relations, and in an existential dialogue with art to prompt questions about the role of the self in terms of external perception. The stark polarity of steel and the opaque black hue that fills the figure is akin to the narrow, vertical tapestries of pencil on paper by Farhad Gavzan, whose works explore the inner landscape of the psyche exhaustively, enough to recall the intricacy of the 20th century European painter known simply as Johfra, specifically his late masterpiece, "Psychological Self-Portrait" (1996). When the overworked salesman Gregor Samsa woke to realize that he was a human-sized insect, as Franz Kafka eternalized in his novella, "The Metamorphosis," he unearthed the psychological ruins of history. Ovid rewrote Greek mythology into a series of mortal dilemmas with his, "Metamorophoses." And in her vivid curations, Tima Jam is vitalizing the tradition of transformative psychology with her twin shows of visual art, "Metamorphosis" I and II, to the sound of Adahan's cellar door.